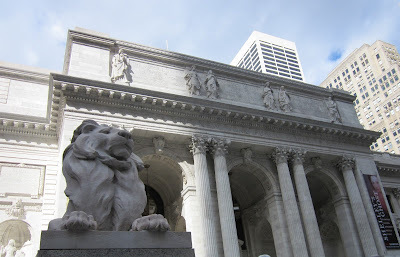 We have been away on a trip to NYC since last Friday and returned last evening, Tuesday, February 28th. We landed at La Guardia in low clouds and rain, but rest of trip was essentially weather-free other than winds and chilly temperatures. 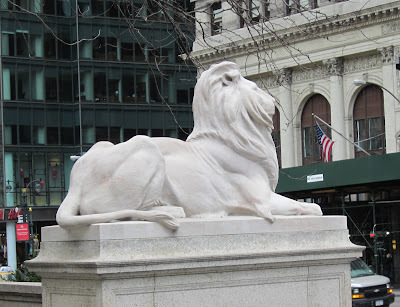 Folks in the NYC area are worried about many spring plants that have come out unusually early this year (see posts below that illustrate the unusual warmth in the Northeast). Photos above are of the famous lions - Patience and Fortitude - at the entrance to the New York Public Library. I don't see even a hint of a sprinkle here at house, and so I assume that there was no precipitation while we were away. 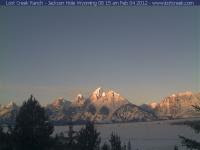 The coldest low temperature was 33F, and I suspect that that occurred yesterday morning. There were strong winds and a bit of dust on Monday in Tucson, and a webcam view of Catalinas (above) shows that there were some light showers around. The views from the plane were very very brown from DFW to TUS, across the drought plagued portions of the Southwest. Considerable dust was hanging in the afternoon boundary layer over southeast Arizona and New Mexico, but skies were nearly cloudless. The current 7-day GFS (operational member - below) forecast of total precipitation for period from now through next Tuesday afternoon (March 6th) continues to keep the Southwest locked in drought. Looks like total rainfall here at the house from mid-December through February will total only 0.37 inches. I too was quite surprised that precip this Water Year is below normal in the Pac NW as well as the West in general. Here are a couple of links that show this well. 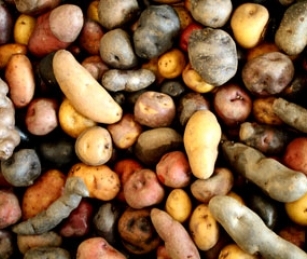 Mark Bittman had an interesting NY Times blog post yesterday about potatoes and other issues. His post was stimulated by the fact that Procter & Gamble recently sold its Pringles brand name to Kellogg for 2.7 billion dollars. The text below has been extracted from Bittman's post. “Basically, Kellogg is big in the business of selling hyper-processed grain heavily laced with sugar, so it makes sense that it seize the opportunity to jump into the market of selling hyper-processed potatoes heavily laced with fat and salt. Don’t, however, make the mistake of blaming the potato for Pringles. (They’re only 42 percent potato anyway, and about 33 percent fat...) Nor should you blame corn for nachos… You can’t blame the raw ingredients with which the earth blesses us for the evil — is that too strong? How about “destructive”? — uses to which they are put. Yet some people, heavily influenced by the bad press both potatoes and corn routinely garner, have asked me whether those foods are indeed “real” and worth eating at all. Corn and potatoes are real foods. Unadulterated, an ounce of corn and an ounce of potato contain 24 and 22 calories respectively; their biggest component is water. (A potato is about 80 percent water.) 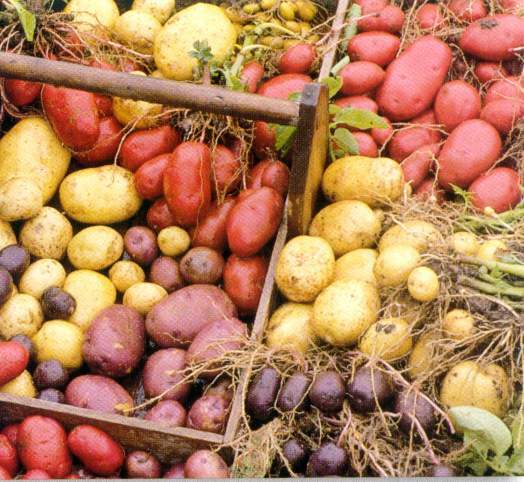 Corn is about 3 percent protein, 2 percent fiber and 1 percent fat; potatoes’ numbers are similar. Not bad. 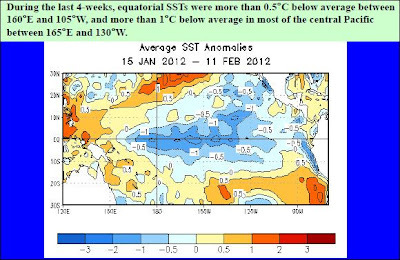 The above graphic is a simplified plot of what are considered "typical" conditions associated with La Nina during December-February. Above (from Lance Bosart via the MAP chat board) shows November 2011 - January 2012 temperatures for the continental US. Below is same map but for precipitation. It appears that there is not much similarity with the "typical" La Nina situation (although there is a month offset between these two figures and one at top). When data for the December - February quarter are in there will probably not be dramatic changes. Perhaps most amazing are the remarkable warmth so far this winter across the northeastern third of the country and the extreme dryness over the northwest third of the country. 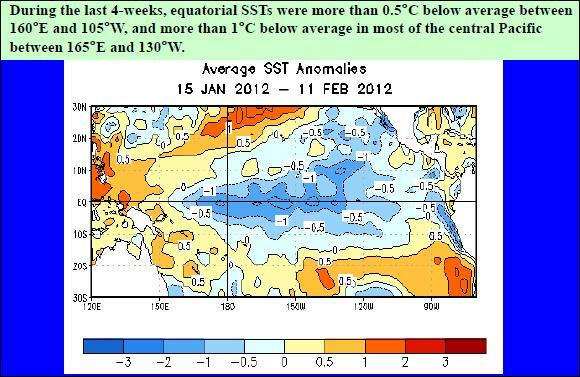 La Nina continues over the Pacific along the equator - current SST cool departures from normal shown at top. Dry flow patterns continue over the Southwest. The operational GFS forecast of total precipitation for next 7 days is shown jus above. 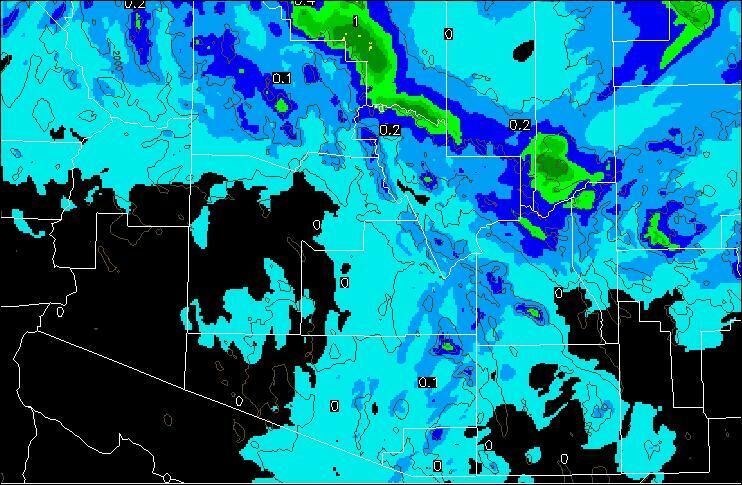 The model predicts no precipitation from west Texas westward across southern California. We have had only 0.37" of rain since December 18th. The system last Thursday produced some thunderstorms southwest of Tucson, but here at the house we had only a very light sprinkle. 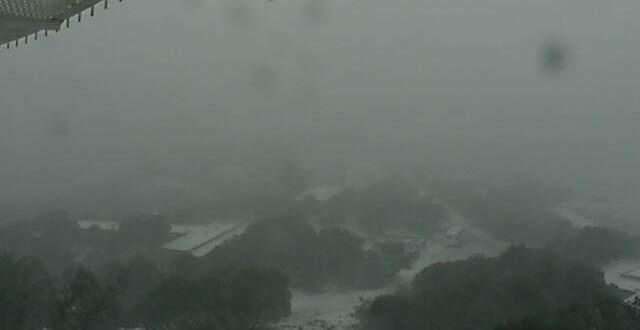 Webcam shots at Kitt Peak (top) and Mt. Lemmon (bottom) at 11 am MST yesterday (February 14th). 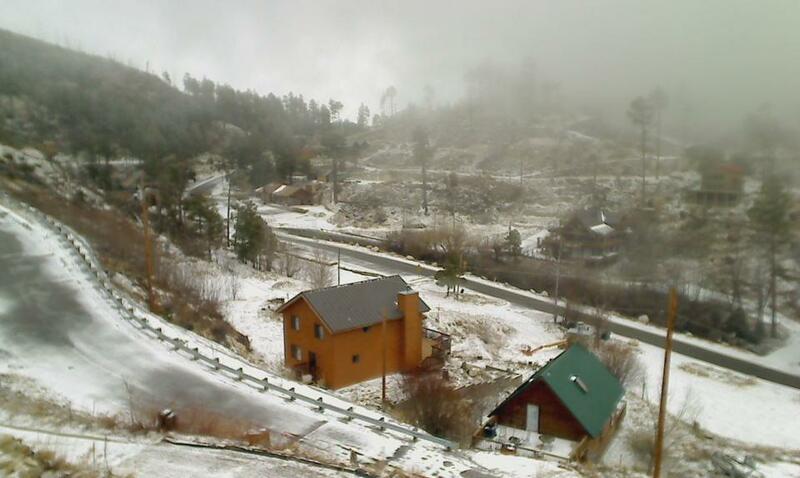 Kitt Peak had picked up some snow already and light snow was just beginning near Summerhaven in the Catalinas. 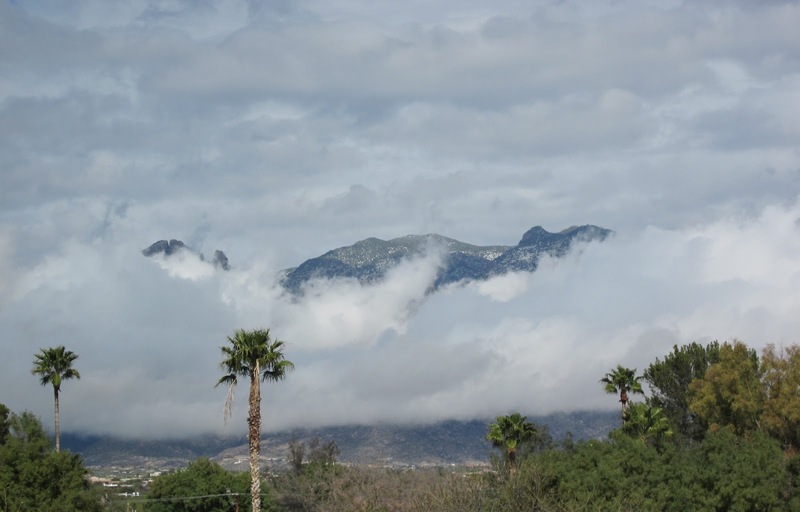 Stratus fractus along the Catalina Foothills (above) at 2 pm MST after the main band of showers had passed. The Catalinas turned purple briefly at sunset (below). We some sprinkles during the late afternoon, but no further accumulation - so we ended up with a tenth of an inch of rain here at the house. Chilly morning low of 28F today. Yetserday during the rain around 1 pm the temperature dropped to 34F here at the house. Shown above are the regional radar plots (from NCAR) for 8 am, 10 am, noon, and 2 pm MST. 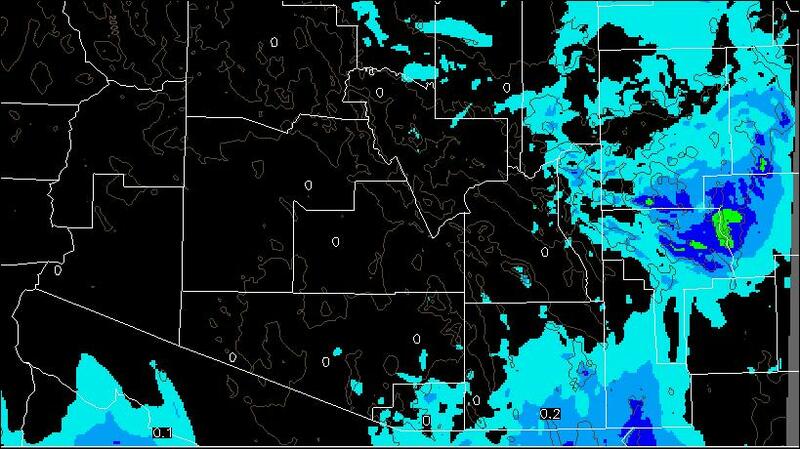 The radar charts show the quick movement of the primary band of showers across Pima County. At 2 pm the sun was back out here at the house, but not before the temperature had dropped into the upper 30s. Most stations in the ALERT network received light rainfall (or snowfall) of 1 to 2 tenths of an inch. Gauge here has exactly a tenth of an inch in it. With the sun back out, the question is now whether we'll get some instability showers as the very cold middle-level air comes over (San Diego was -29C at 500 mb this morning). First - a shot of stacked lenticular clouds (above) that developed over the Catalinas around 5 pm MST yesterday afternoon. Atmo's early run of the WRF-GFS is slower today on bringing the current weather system through eastern Pima County. The above forecast is of total precipitation through 6 pm this MST this evening. It is similar to yesterday's, although amounts across the north metro area are up a bit - still generally a light precipitation event, except in the mountains. 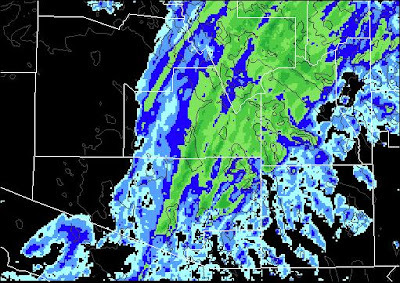 The composite radar forecast (above) indicates the primary shower band moving through the metro area around 3 pm (behind the front), and the forecast surface plot valid at 1 pm MST (below) indicates a more amorphous frontal passage during the lunch hour. Will now observe the details of what transpires today. A fast-moving weather system is digging southeastward across northern California this morning. The water vapor image (above, for 14 UTC) shows the upper-tropospheric short-wave to be a bit north of San Francisco. 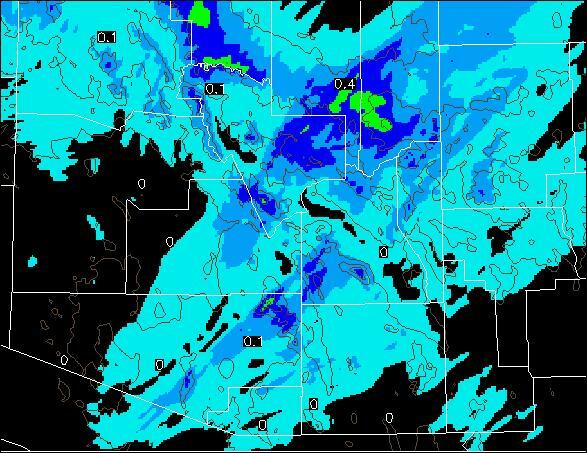 The early (midnight) run of Atmo's WRF-GFS model forecasts this to be a fast hitting system here in southeast Arizona. The plot below shows the forecast by the WRF-GFS of total precipitation through midnight tomorrow (14 February 2012) night. 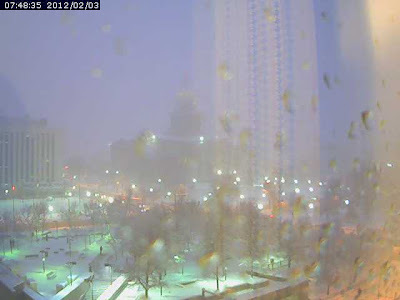 The event is forecast to be mostly one with light precipitation and showers. 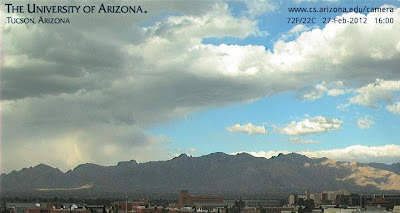 The most precipitation is indicated, as snow, on the Catalinas and Mt. Graham. The WRF-GFS forecasts the event to impact the Tucson metro area tomorrow morning. 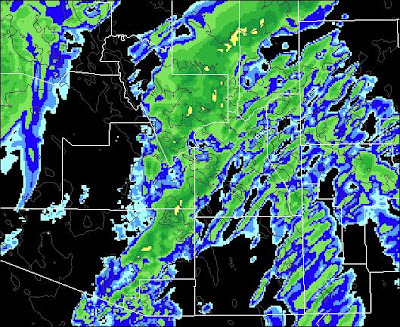 The composite radar echo forecast above is valid at 9 am MST and indicates the main rainband with the system to be moving across eastern Pima County. 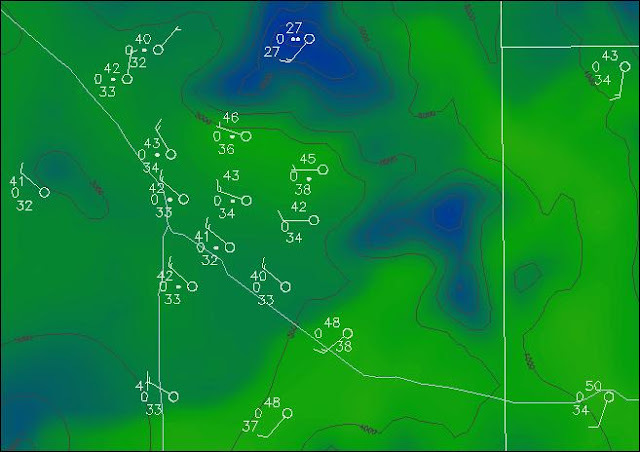 The forecast 9 am surface plot (below) shows the pronounced cold front moving eastward and about to exit Pima County - with the rain band located along and behind the front. The WRF-GFS forecasts are similar to those this morning by the NWS NAM model wrt the light character of the event, but are several hours faster than the NAM. So, it appears that a damp and chilly weather event is on tap for Valentine's Day. Art Douglas reports, from near the mouth of Ramsey Canyon,: It's 3:45AM and the wind is howling like crazy at my house.........here is the wind profiler. 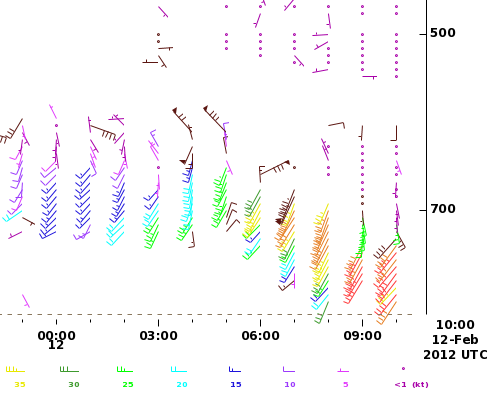 He sent along a data display from the Ft. Huachuca wind profiler, and I've snipped out a portion of the time series that runs from around 00 UTC yesterday to around 10 UTC this morning (3 am MST). Note that by around 04 UTC (9 pm MST) a layer of strong winds extends from near mountain-top level upward for about a 100 mb. During the night this layer descends steadily and reaches the surface after midnight. This is the second wind event this year that appears to have been influenced by a mountain-wave downwind of the crest of the Huachuca Mountains. Edited to add: observations from a weather station near Art indicate a number of gusts before noon today of 40 to 65 mph. I've been looking at the photo in the previous post and remembering Category 5 Hurricane Camille. 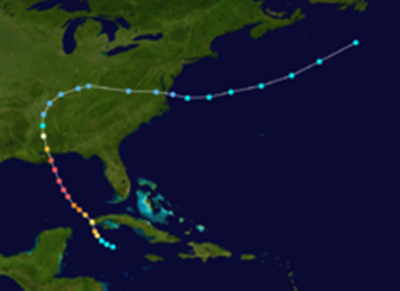 This storm came ashore during the night of August 17, 1969, near Biloxi, Mississippi. 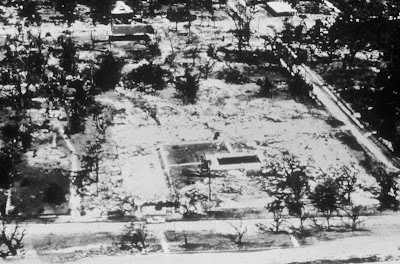 Wind speeds approached 200 mph and damage was extreme. Camille's track is shown below. 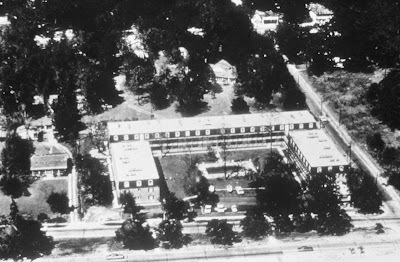 Above are before and after photos of an apartment complex where more than 30 people, who refused to evacuate and held a hurricane party, perished. 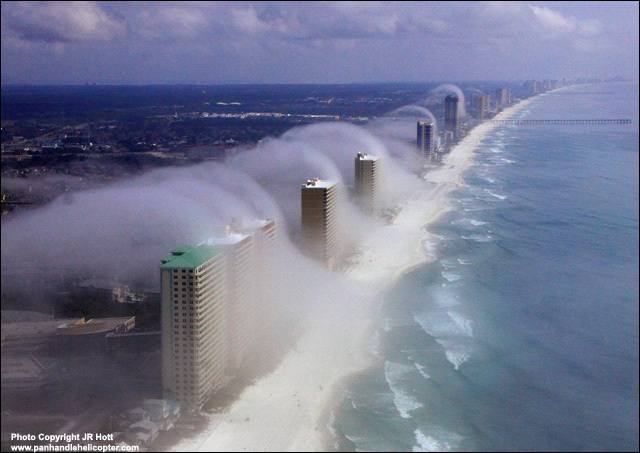 You'd think we'd learn from the past, but the high-rise condos below look like a line of dominos waiting for the next category 5 hurricane. 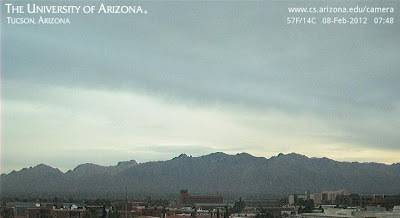 This morning (February 8, 2012) dawns with heavy middle and high cloud locally, as per webcam view of the Catalinas (above). 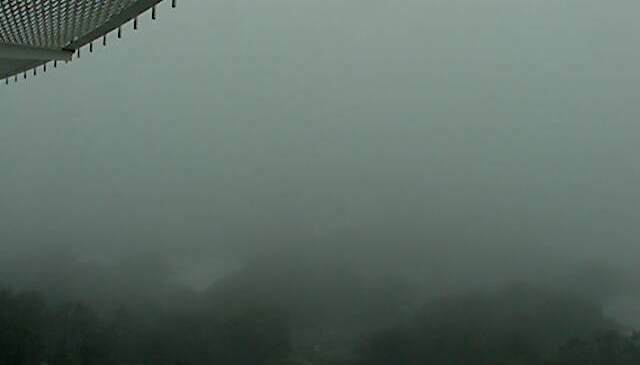 In contrast, Kitt Peak is currently in the clouds, as per ghostly image below. The moisture has ridden in on southerly winds to the east of the 500 mb closed low that is moving southward along the northern coast of Baja. Current composite radar image (above) indicates that there may be some sprinkles around southeastern Arizona, but the echoes are mostly from the heavy cloud cover. This morning's run at Atmo of the WRF-GFS forecast model indicates little precipitation accumulated through 5 am on Friday the 10th (below). 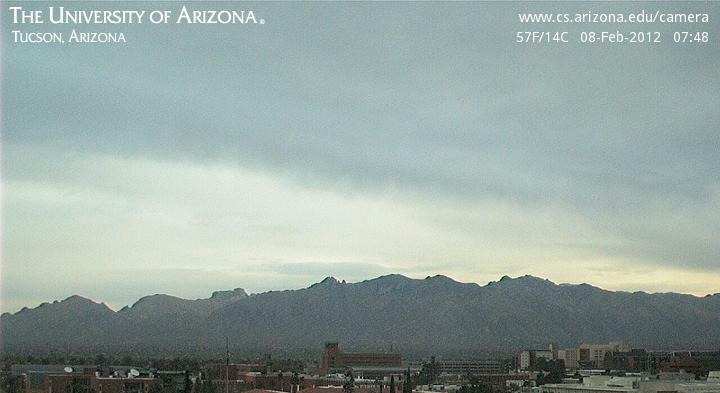 What measurable rainfall there is in the forecast occurs over the far southeast corner of Arizona. There were two thunderstorms that produced severe winds (my estimate was 60 to 65 mph gusts each day) here at the house. Both were in July and occurred on the 4th and the 7th. 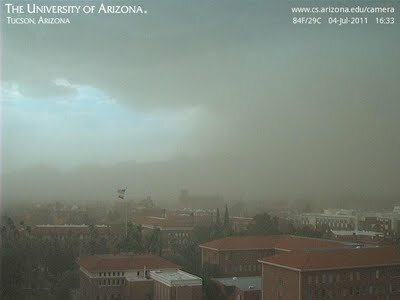 The photo above is the dust storm at the leading edge of the storm outflow on the 4th. Davis-Monthan had a gust to 77 mph on July 5th. 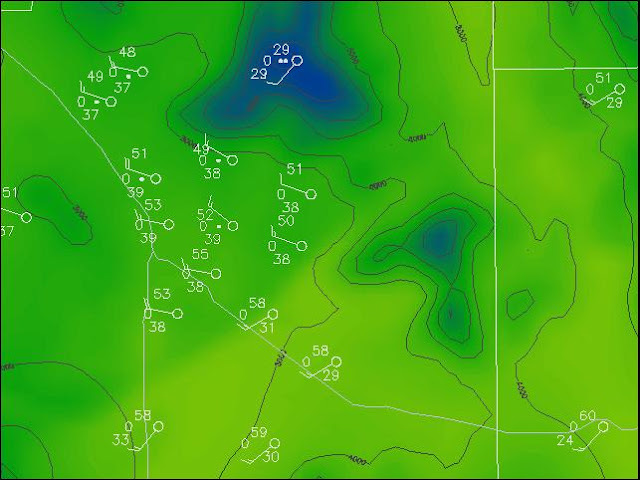 On September 15th TUS had 2.84" of rain, and Davis-Monthan 1.94", from heavy thunderstorms that stayed on the south side of the city - here at the house there was only 0.01" on that day. The summer "monsoon" season began June 28th and ended about September 5th - based on my analyses of tropospheric flow at and above 600 mb. After September 5th, winds aloft were southwesterly to northwesterly, and wind shear became quite supportive for severe thunderstorms that moved toward the northeast (i.e., a more typical, central U.S. severe thunderstorm environment). Such storms that can tap residual, low-level moisture at the end of the monsoon are sometimes referred to here as "transitional" storms. Rainfall during the monsoon was quite anemic, totaling only 2.74" here at the house. In contrast, the last part of September and November and December were quite wet, producing 6.86" of rain. Far and away the most severe weather event of 2011 here in southeast Arizona was the extreme cold, with persistent wind, that occurred from the 2nd to the 4th of February. The damage from frozen water pipes and to vegetation was very extensive. Here at the house we had consecutive lows of 18, 14, and 11F on these three days. 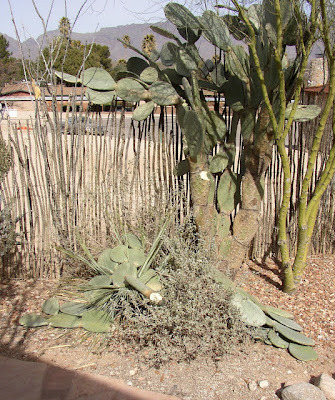 I was still clearing out dead and downed catcus in the northeast corner of the back yard this past weekend. Shown below are a photo of some cactus damage, and the 850 mb chart at 12 UTC on the 2nd, as the massive cold pool was sinking southward across most of the country. So there were 76 days here at house with morning temperatures of 32F or colder and 32 days with hard freezes of 25F or colder. 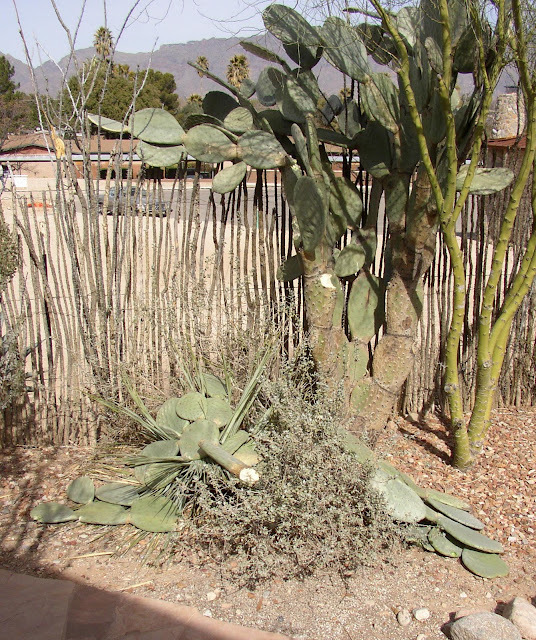 Those who follow the blog know that this area along the Rillito is one of the coldest spots inside the city limits of Tucson.. The NAM 72-hour forecasts this morning predict a very cold cyclone to be situated just east of Hudson Bay by 12 UTC on Thursday morning (February 9, 2012). 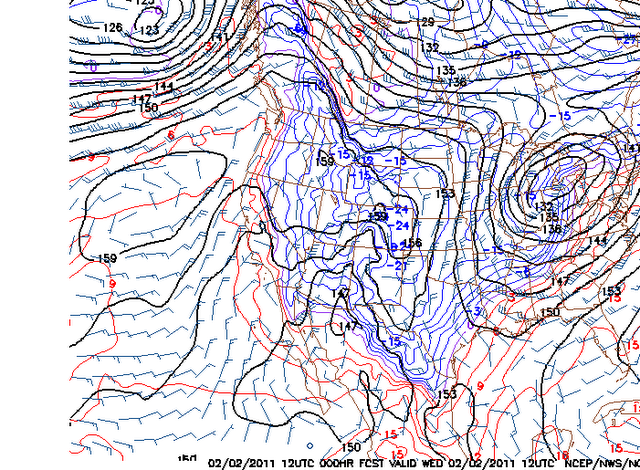 The forecast at 500 mb (above) shows central heights well below 5000 m, which is quite impressive. At 850 mb (below) the cold core temperature is forecast at -42C; again quite impressive. So, it appears that northeastern North America is going to be hit by very cold temperatures, even as the extreme cold continues over Europe. The comparatively weak closed low along the cast of Baja threatens to bring some clouds and perhaps sprinkles to southeastern Arizona in the same time frame. From west to east this morning: top Grand Tetons, middle Boulder Flatirons, bottom Omaha. 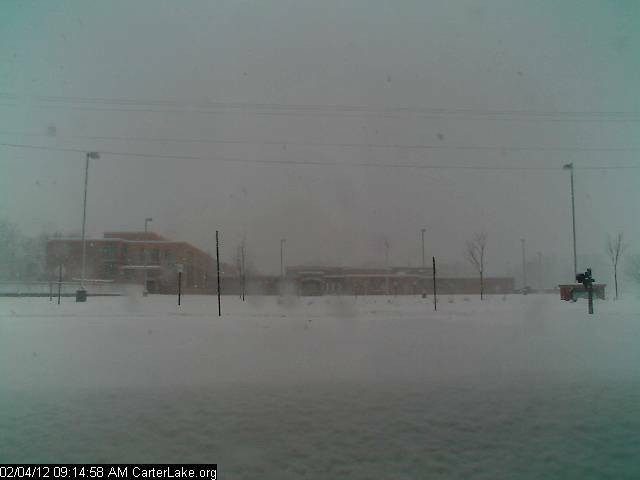 Heaviest snows now occurring over eastern Nebraska and Iowa. 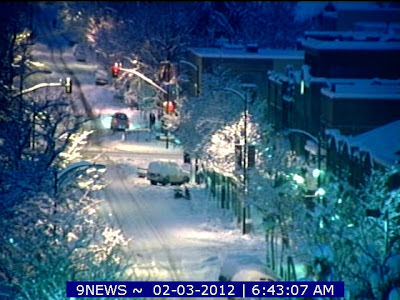 State Capital webcam in Denver - look close to see the Capital Building. Notice on DIA web page about flights today. 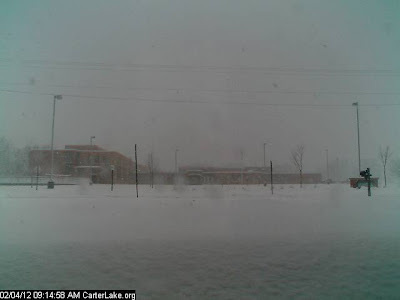 Note that 300+ flights have already been cancelled this morning. 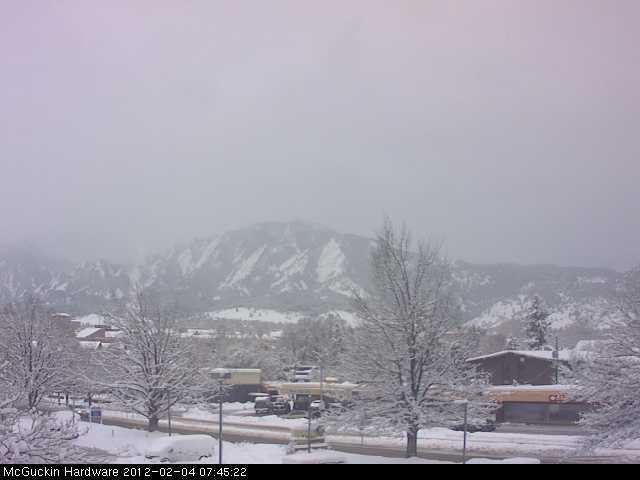 As mentioned yesterday, a winter storm is developing for the Colorado Front Range and the High Plains of west Kansas and Nebraska. The NAM forecast from this morning's run (for 850 winds and PW) is shown above - valid at 12 UTC tomorrow morning (Friday, February 3, 2012). The 850 low over southwestern Kansas has pulled high PW air northward all the way into southern Nebraska. 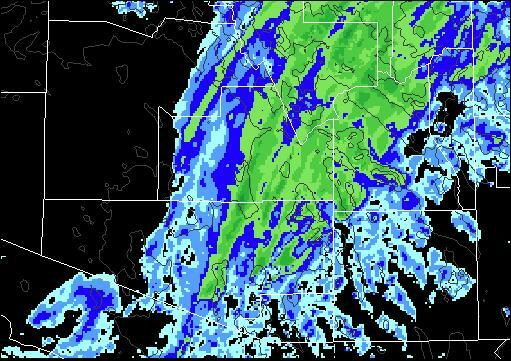 The 36-h NAM forecast valid at 6 pm CST tomorrow for total precipitation is shown below. The model forecasts over an inch of precipitation for much of eastern Colorado - where it will come as snow. Forecast amounts are highest near Kansas City where the model forecasts over 2 inches of rain - however, the precipitation and temperature gradients are very sharp along the southern borders of Iowa and Nebraska making for a tough forecast situation there. 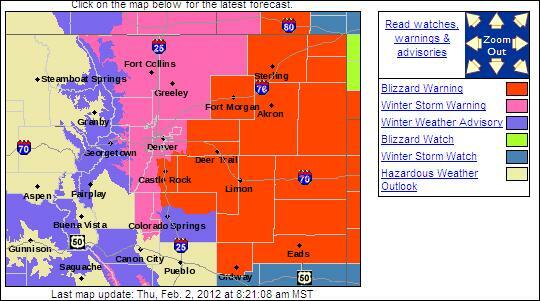 The graphic above (from the Denver/Boulder NWS Office) shows that a blizzard warning is in effect for northeastern Colorado, and that a winter storm warning has been issued for the Colorado Front Range region. 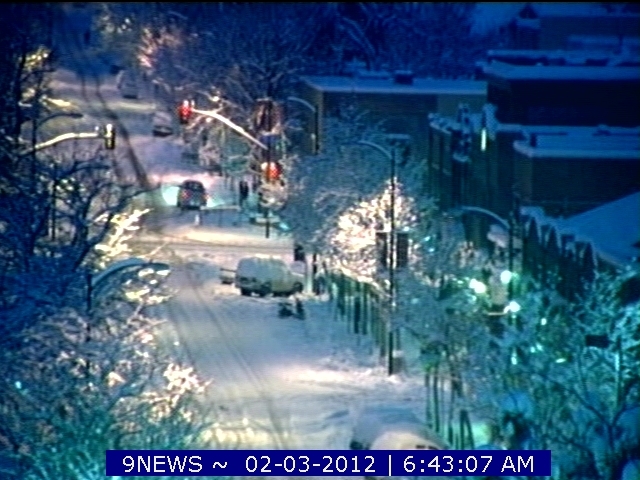 The Denver International Airport (DIA) lies just west of the blizzard forecast area. The current ~1 km NWS grid point forecast at DIA is for a 90% chance of snow tonight and tomorrow; accumulations of 9 to 17 inches; and north winds with gusts as high as 33 mph. I guess the 90% probability is a CYA conditional forecast that says there could be a 10% chance that the storm will miss DIA (this NWS probability < 100% with accumulations is a pet peeve of mine!). As for the travellers likely stranded at DIA tomorrow afternoon and night - they probably won't care whether it was a winter storm or a blizzard that waylaid them. Finally, the SPC anticipates some wintertime severe understorms as early as late this afternoon and evening. The above is today's convective outlook.